Please give us your feedback on your situation with ad blocking by taking just a few minutes to participate in our industry-wide survey. 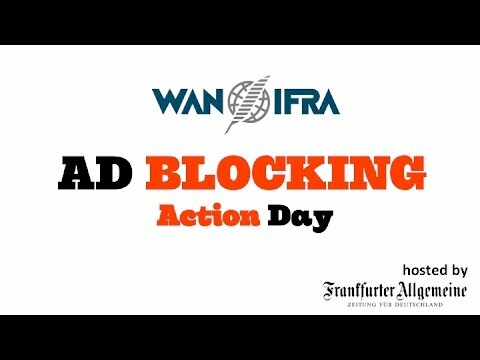 Keep up to date on the latest news about Ad Blocking at WAN-IFRA's microsite dedicated to this issue. You may download copies of today's presentations here. But if the frank, open discussions that took place at this intimate gathering at the headquarters of Germany's Frankfurter Allgemeine Zeitung is an indication of the willingness of publishers to truly address this issue and cooperate, there is indeed hope. This event brought together 50 participants from 14 countries: publishers, tech providers, privacy advocates, and other specialists. And it was clear from the first speaker that participants were taking the "Action" part of this gathering to heart: questions, comments, disagreements were the order of the day. And welcomed by all (at least we hope). It was encouraging to see seemingly competitors sharing intimate details about lessons learned on this topic. 1. User experience: Publishers most precious asset is the trust and goodwill of their audiences, and we have to improve the overall ad experience for users without ad blockers – were points mentioned by Ben Shaw, Director of Global Advisory, WAN-IFRA, as well as several other speakers. But what was stressed throughout the day was the need for publishers to stand together and take the lead on defining this experience, particularly to advertisers and ad agencies. 2. Learning from ad blocker users: Distracting ad formats are not the only reason people are installing ad blockers. Germany's FAZ undertook a non-scientific survey of their readers using ad blockers over a five-day period in October 2015, said Nico Wilfer, Head of Product Development FAZ.net. "We wanted to start a discussion with adblock users without generating a lot of buzz," he said. This meant, "inserting a message on every page of faz.net, in which we asked them to turn off their ad blocker to support quality journalism." 35% of their users said they fear malware. He added that concerns about data protection were also frequently mentioned by respondents. Furthermore, about 10 percent of users simply wanted to speed up load times. 3. A call to think: “This is a problem we want to see in context. Ad blocking growth is linear. Not exponential. It's a real issue, but there's no reason to panic about it,” said Dr Johnny Ryan, Head of Ecosystem for PageFair in Ireland. Instead, he says, ad blocking should be viewed more along the lines of climate change: it's slow, incipient and happening over time. 4. Privacy concerns: “If you don't want to go the same way as the music industry, you [publishers] have to take a more acceptable, ethical route,” said Alexander Hanff, CEO and Founder of Think Privacy. Ad blocking brings a range of controversial issues, privacy concerns among them – something that gets lost on publishers, according to Hanff. Indeed he brought some balance to the discussion, pulling no punches during his presentation and while quizzing other speakers during theirs. Not surprisingly, improve the user experience for advertising. "We are transforming to a new platform of all our products," she said. "We will focus on the content where most of the ads will appear." Taking part in a cooperation with Swedish publishers, including coordination from IAB as well as cooperation with tech providers. Doing more to promote and drive users to their app (where ads can't be blocked). Around 60% of traffic comes from its mobile app. Increase the use of branded content and native ads. 6. Technical solutions: We definitely need more than one technical solution, and these solutions should not be protective (withholding content), but to keep us independent from relying on the goodwill of users, said Dr. Lars Janzik, VP Product Management for Axel Springer's WeltN24. He added that Springer, on average, had fewer than 30 percent of readers using ad blockers during 2015, but there was a dramatic increase in November 2015 after Firefox updated their browser. Their current mobile ad blocking rate is less than 3 percent. 7. The right ads: “We can put a form of ads back, but publishers, Web trustees and consumers must decide what form these ads take,” PageFair's Ryan said. A possible starting point for this, he suggests, is to consider the ad forms that PageFair, through numerous surveys, have learned that people are most accepting of: Skippable pre-roll video ads; still image ads, and those with text display. Photos by WAN-IFRA's Raquel Devís Sanchis. More photos from the event can be found here. Presentations from the session can be downloaded here. WAN-IFRA's Director of Publications, Dean Roper, contributed to this post.